Richard Strauss was very fond of François Couperin’s music. He penned three works, a Dance Suite, Verklungene Feste, and the Divertimento after Couperin, Op. 86, because he believed Le Grand’s Pièces de clavecin ought to be better known. Respighi had a similar idea; thus, the three Ancient Airs and Dances suites. When orchestrating or arranging, composers generally treat another’s work with respect, sincerely believing that they’re either improving upon the original or creating new listening opportunities. Conductors have also gotten into the act, altering music to suit their available forces. Let’s consider several famous and not-so-familiar arrangements and transcriptions. Mozart’s pumped-up Messiah enjoys a life on CD and the concert stage. Rimsky-Korsakov reworked Mussorgsky’s instrumentation. Mahler completely rescored Schumann’s four symphonies and mixed and matched movements from Bach’s orchestral suites. Bach frequently rethought his contemporaries’ work, transcribing for organ Vivaldi’s string concertos. Stokowski famously or infamously supplanted Bach’s “king of instruments” with his Technicolor orchestra in continuance of a long tradition. On Chandos CHAN 9835, Leonard Slatkin and the BBC Philharmonic perform a large batch of Bach orchestrations by Bantock, Elgar, Holst, Honegger, Joachim, Reger, Respighi, Schoenberg and Vaughan Williams. Bach’s didactic keyboard works have been variously recast: Mozart arranged preludes and fugues from the Well Tempered Clavier for string trio, the Goldberg Variations has been reincarnated for strings, and you can choose from a quartet of saxophones, modern strings or viols for The Art of Fugue. Out of practical necessity, composers often delivered reductions of larger canvasses to their publishers. Churning out home-bound arrangements was a big industry, and many listeners’ first exposure to works now considered symphonic classics was through transcriptions for piano four-hands or two. Beethoven, who complained about others’ reductive efforts, rescored his Second Symphony for piano trio. Busy composers often fobbed off such tasks to their students, but several virtuoso pianist-composers relished distilling the symphonic palette onto 88 keys. Liszt arranged Beethoven’s nine symphonies for piano, and along with Busoni, he happily paraphrased operas, a tradition Michael Finnissy continues to this day. Barber’s familiar Adagio has become a choral Agnus Dei; from Mahler’s Fifth Symphony, Gérard Pesson grafted August von Platen’s words for an a cappella Adagietto (both on Naïve V 4947). Let’s depart the concert hall to gaze in wonderment at some of the strangest transcriptions and arrangements ever. We’re not going to dwell on Spike Jones’ joyous shenanigans or the worthy who compressed Wagner’s Parsifal into a pantomime for clarinet, accordion and double-bass. I have no qualms with Cage, Kagel, Schnittke or Rochberg about borrowings and hijinks consistent with their aesthetic, nor do I object to Wendy Carlos’ deliciously camp “Switched-On Bach,” even though her 25th-anniversary remake, “Switched-On Bach 2000,” is dreadful. Arnold Schoenberg was a skilled arranger. For the short-lived Society of Musical Performances (Verein für Musikalische Privataufführungen), he and his students fashioned chamber music arrangements of Bruckner, Busoni, Debussy, Mahler, Ravel, Reger, Johann Strauss and Luigi Denza (“Funiculi, Funicula”). His Brahms G-minor Piano Quartet orchestration brims with admiration for the elder master. His transcription of Bach’s St. Anne Prelude and Fugue, despite quirky textures, is duly respectful. The Cello Concerto after Monn is unassuming. Well and good. But then we have the Concerto for String Quartet and Orchestra after Handel, one of Schoenberg’s most curious creations, “grotesque and horrible” in a colleague’s words. Schoenberg appropriated Handel’s Concerto Grosso, Op. 6 No. 7, undermining its original form. 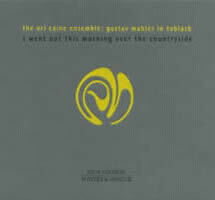 Cymbal crashes, xylophone, and stringed-instrument effects accompany bizarre harmonies and incomprehensibly abrupt tempo and texture changes. The transcription fails at humor, unlike Haydn’s Surprise Symphony or Walton’s Façade. If Schoenberg meant to be sarcastic, in the vein of Nielsen’s enigmatic Sixth or Bartók’s derisive poke at Shostakovich in the Concerto for Orchestra, his single-minded persistence overwhelms all. Schoenberg isn’t into academic contextualizing or a postmodern, quote-sodden pastiche, as are, decades later, Zimmermann in his Musique pour les soupers du roi Ubu or Bruno Maderna, in his Satyricon (Naïve MO 782174). I’m well-acquainted with Schoenberg’s “Style and Idea,” so my dismay that he actually took the time to write this out can’t be dismissed as a too-easy shot at a much-maligned composer. Some works, like the rarely heard Kol Nidre, quirky combinations of tonality and non-tonality notwithstanding, are internally consistent. The 12-tone Ode to Napoleon Buonaparte closes awkwardly in C major for a reason. Schoenberg generally made his choices conscientiously. We know he had no sympathy for Handel’s original: “… in the third and fourth movements, whose insufficiency with respect to thematic invention and development could satisfy no sincere contemporary of ours, I have acted quite freely and independently, and, while employing what was usable, undertaken an entirely new structure.” Given Schoenberg’s attitude and mad results, why did he bother at all? The adaptation is a monument to bad taste, a squandering of effort and ink, exasperating when we consider the serious work Schoenberg never finished. 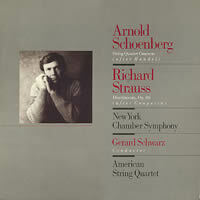 The music clearly bewilders the American String Quartet with Gerard Schwartz and the New York Chamber Symphony on Nonesuch 9 79145 2 (O/P). Strauss’ docile Divertimento after Couperin, Op. 86, completes the program. 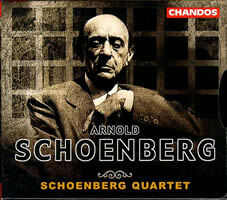 Completists will need the Schoenberg Quartet’s sadly inconsistent five-CD brick (Chandos CHAN 9939) containing every Schoenberg composition written or arranged for strings. Luciano Berio’s modus operandi included reworking his and others’ music. His masterful orchestrations include Brahms’ First Clarinet Sonata and songs by Mahler and Berg. Several of his Sequenzas mutated into Chorales. Most famously, an entire Mahler symphonic movement became the backdrop for an elaborately stunning collage in Sinfonia. Berio provided a nondescript ending for Puccini’s Turandot. 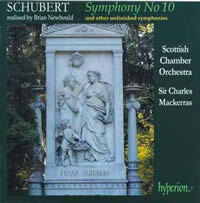 However, his Rendering, ostensibly a “restoration” of Schubert’s unfinished Tenth, is a disturbing postmodern fantasy. Rendering begins with several nice themes (Schubert left incomplete pages in piano score) including a Sullivan-like (as in “Gilbert &”) gesture. But this scrim soon lifts to reveal two-by-fours, canvas backs and stagehands pushing brooms. When there’s not enough real Schubert, Berio concocts “connective tissue” and the harmony goes funny under a twinkling celesta. Suddenly we’re in a polytonal waiting room where other Schubert passages loiter as if warming up for an audition. The opening was an illusion, a clever assemblage. Then the jangling celesta stops and the time machine deposits us back in Schubertville, though the spell has been broken and we’re now wise to Berio’s tricks. The celesta also suggests Der Rosenkavalier, wherein Strauss was playing at being Mozart. Berio folded another celesta into his Turandot completion. This must be what footnotes sound like. I am glad to know these Schubert tunes, and have grown fond of Rendering. Several spots, such as the last movement’s rising-fourth motif, are filled with radiant promise. Brian Newbould’s realization of the same sketches is in three movements (Hyperion CDA 67000). The opening, conjuring a music-hall stage, is hard to reconcile with other final Schubert works (Winterreise, the String Quintet, Schwanengesang, et al.). The scherzo bits are delightful. Of course, now that Berio has poisoned my ear, even scholar Newbould’s fleshing-out has its suspect moments, such as the strong trombones in the Andante. That’s the problem with such tinkering: My faith in the printed page and any editor’s work is compromised. 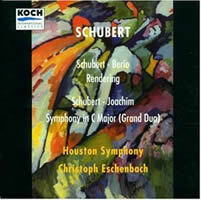 Christoph Eschenbach leads the Houston Symphony on Koch 3-7382-2 H1 (O/P) in the most musical performance of Rendering, Joachim’s pedestrian orchestration of the Grand Duo, D. 812, completing the disc. 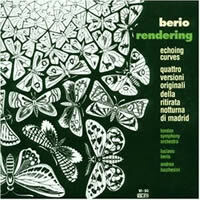 Berio serviceably conducts the London Symphony Orchestra in Rendering, his straight-ahead piano concerto, Concerto II, “Echoing Curves,” and a Boccherini pastiche Quattro versioni originali della “Ritirata notturna di Madrid” on RCA 09026-68894-2 (O/P). 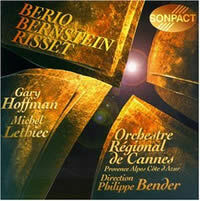 The celesta and non-tonal transitions are prominent on Disques Sonpact SPT97020 (O/P), where Philippe Bender leads the Orchestre Régional de Cannes in concertos by Bernstein and electroacoustic pioneer Jean-Claude Risset. Bach probably shoulders the greatest quantity of arrangements. Alongside successes there are also denigrations. A recent release in David Cope’s “Experiments in Musical Intelligence” series targets Bach (Centaur CRC 2619). Cope programmed a computer with algorithms representing Bach’s gestures and quirks. Technically a success, though I can’t label the results as music. Coarse transitions feebly bind soulless chatter. Live musicians read passably through Cope’s generated drivel. Centaur’s rough presentation contains incorrect track lengths. Why listen to or perform this rubbish when there is so much great Bach, or, in desperation, Vivaldi or Torelli? Caine has also roughed up Beethoven, Schumann and Wagner. His Mahler concoctions are among his most successful work, even though purists will find them offensive: “Urlicht” (Winter & Winter 910 004-2), “Mahler in Toblach” (Winter & Winter 910 046-2), and “Dark Flame” (Winter & Winter 910 095-2). 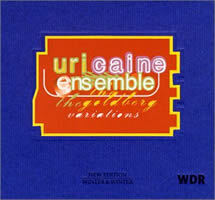 After studying the Austrian composer for a year, Caine uses Mahler as a welcome mat to bizarre arrangements and improvisations. A wildly melismatic singer romps through Das Lied von der Erde’s “Der Abschied,” and the First Symphony’s klezmer tunes succumb to tampering. The Fifth’s trumpet fanfare withers into the background, supporting something altogether unrelated. 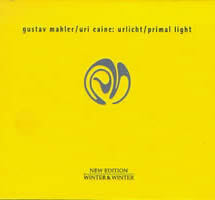 Caine has defaced Mahler: The fin-de-siècle mood shattered, we’re stuck in a nasty-smelling, dimly-lit elevator. But Caine’s Frankensteins don’t posture with the academic seriousness of Schoenberg’s Handel or Berio’s Schubert. 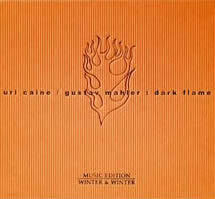 Destructive, yes, but Caine rarely comes across as pretentious — foolish and misguided rather.